Libby's Little Addiction: FCD presents Atypical Artwork! Welcome to another FireCracker Designs by Pamela blog hop!! You hopefully came here by way of Pamela - if not, you probably will want to back up. There is a yummy prize hidden somewhere along the hop, and you don't want to miss it - so make sure you hit each and every blog along the way!! The theme for today's hop is "Atypical Artwork" - taking stamps and using them in a new way, different from how they were intended. How fun is that?? So - can you tell what I did? I took the leaf stamps from the Stinking of You set and created a butterfly! I thought he was a very elegant butterfly, so I paired him with this gorgeous frame I picked up a couple of days ago at Joann's, made by K&Co. The Script Cuttlebug folder is also new to me, and I LOVE it! The quote inside the frame is from the Forgive Me? set. As I was creating the butterfly, cutting out the body that I just made up as I cut, I was debating about whether or not he needed antennae. I looked at the set again, and thought the little dandelions could make interesting antennae. But, I didn't think they'd go with my elegant butterfly. Then I noticed the little egg in the set, and for whatever reason I got a vision of a little caterpillar made out of eggs and dandelions. :-) So, I couldn't go to bed until I made a second card! :-) I colored him in to resemble The Very Hungry Caterpillar, one of our favorite children's books. The other thing to point out about this second card is that it uses the latest Weekend Sketch Challenge, this time hosted by Sharon Harnist. Alrighty, have I kept you here long enough with my babbling?? Ready to hop on to the next blog?? Then head on over and check out what Julie did - I'm fairly confident that it's going to be AMAZING!! That Julie sure can stamp! :-) And just a little reminder (reminder because no doubt you already read this on Pamela's blog!) - you have until Wednesday, April 29 at 7:00pm CST to finish hopping and get entered into the drawing. Got it? Good! Thanks for stopping by today!! LOVE the butterfly!! wow! and how stinking cute is that bug!! Awww, HOW CUTE!! The caterpiller is adorable!! That's what's fun about this kind of challenge - it really gets the juices flowing, and lets you see things in a while new light! WOW!! Your butterfly is gorgeous Libby!! I really love that beautiful frame you picked out too!! Love that caterpillar!! What clever ideas you have!! Brilliant!!! This is stunning, Libby! 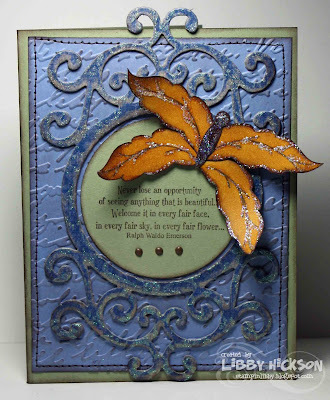 The colors and embossing and the wrought iron look behind your butterfly are all wonderful. Your second card is just adorable. Great job! Cute cute cute! I will have to start thinking of different ways to use my stamps! Great job! Wonderful cards this morning Libby...I esp love the caterpillar card...been reading that to Cole! That butterfly is truly inspired! I think the caterpillar is adorable and i like the theme. Simplicity for the caterpillar, become elegance and more co0mplicated butterfly. Or in this case the other way around! I love how you made the butterfly - beautiful card. LOVE IT! That butterfly is great - the caterpillar is a lot of fun as well! Oh for goodness sake that butterfly is gorgeous! What a great idea! And the Hungry Caterpillar he is phenomenal! I love that book too (I am lucky enought o have a signed copy from the author) and this is a great rendition of it! Great job on the cards!! Awesome, especially the caterpillar!! 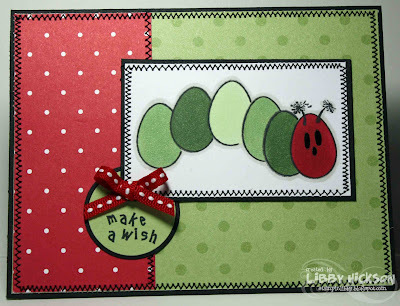 Elegant leaf butterfly card and cute egg caterpillar!! Very creative adaptations and great cards! Wow, your butterfly is just amazing, and the caterpillar is so cute! Very beautiful...love how you made the butterfly!!! I really enjoyed Libby's card. I loved the color combo and also the way the butterfly she created looked like it is about to fly off the card. That caterpillar is the cutest thing I have ever seen. I love seeing people taking things like Easter Eggs and making something else out of it. I have to scraplift this idea. I love to read The Hungry Caterpillar to my grandsons. I think I will make a card out of this idea and send it to them. Thanks for being a part of the blog hop! Wow! You were busy this weekend stamping and those cards are adorable...I definitely don't think out of the box like that! Great job with the sketch, adorable catepillar!